When Thicket Elemental enters the battlefield, if it was kicked, you may reveal cards from the top of your library until you reveal a creature card. If you do, put that card onto the battlefield and shuffle all other cards revealed this way into your library. I'd drop Mossbridge Troll since you only have 2 creatures with 10+ power and not many ways for +1/+1 counters. I'd look for more card draw too. Suggestions, Primordial Sage , Harmonize , Rishkar's Expertise , Shamanic Revelation , Colossal Majesty . 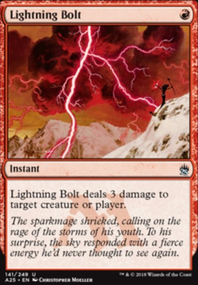 You have plenty of mana ramp, so I would personally throw in a Thicket Elemental with kicker to cheat another creature to the battlefield. 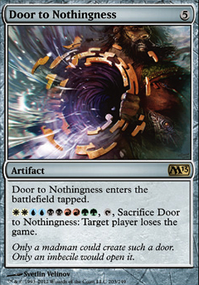 I also think a must for this deck is Tooth and Nail , ESPECIALLY since you already have a Concordant Crossroads . If for whatever reason you don't have your Crossroads out you can just TNN Surrak, the Hunt Caller + anything else to have it attack that turn. A couple of possible ramp options if you want to avoid creature based ramp are Wild Growth and Fertile Ground. There's also Abundant Growth if you need early colour fixing: netting a card in the process is just gravy. 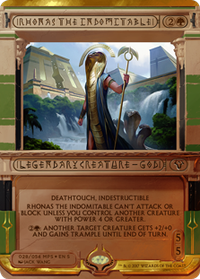 Yeah, So...In the last 24 hours, I did a bunch of work on this deck, proxied a bunch of it up, took it for a spin in front of a goldfish bowl, and I discovered I needed to make some changes. 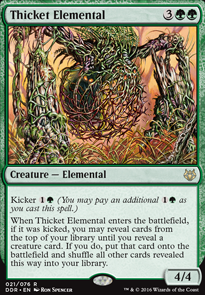 @Hi_diddly_ho_neighbor, I didn't want to include Thicket Elemental because I might accidentally put a badly needed kickable-creature in play. 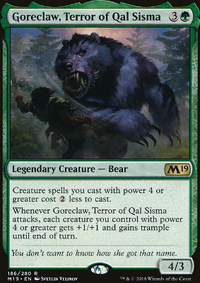 Hunting Wilds for more ramp, Thicket Elemental for another tutor effect, Ghitu Chronicler and Past in Flames to buy spells back, and Selvala, Heart of the Wilds and Neheb, the Eternal for big bursts of mana all might be great inclusions. seshiro_of_the_orochi on Good Golly Gosh, Ghalta! Scute Mob helps you cast Ghalta. And it does even better if games go longer. Root Elemental and Myojin of Life's Web are pretty similar, but both very powerful here. Considering your amount of token generation, Stag Beetle might be interesting for you as well. Also, how about Ulvenwald Observer and Soul of the Harvest? Also, Thicket Elemental, Garruk's Horde, Mouth / Feed and Cream of the Crop all seem like they could do a good job here. 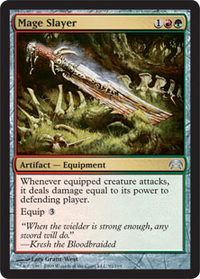 Oh, and then, there is Zendikar Resurgent.